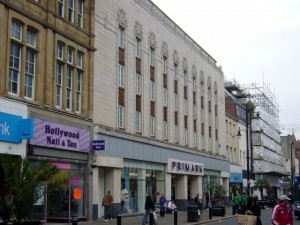 In an earlier post, I talked about some of the large, city centre Woolworths stores – such as the branches on Newcastle’s Northumberland Street and Sheffield’s Haymarket – that were closed down in the 1980s as the retailer trimmed its ranges and focused on generally smaller shops. The closure of that store meant that the only Woolworths left within Sunderland’s boundaries was the one at Houghton-le-Spring, which shut down along with all the others following Woolies’ administration at the end of 2008. Before that, there apparently used to be a Woolworths store, of sorts, at Washington Galleries. This closed in the 1980s, but was a Woolco shop – a Woolworths-owned out-of-town, discount department store and supermarket – rather than a Woolies proper. While I’m old enough to remember the Woolco name, I can’t recall ever going to one of the stores. From what I can gather, there were only ever 14 UK Woolcos opened – many in New Towns, and including two other North East stores in Killingworth and Thornaby – all of which were sold off to Dee Corporation (Gateway) or Asda by 1988. I understand that Asda stores still occupy the former Woolco sites at both Washington and Thornaby, while Killingworth’s was eventually demolished and replaced by the Killingworth Shopping Centre. Photos of old UK Woolcos (as opposed to the US chain) seem quite hard to come by – I’d be delighted to post some on this blog if anyone has any that they would care to share! Next story Waitrose Hopwood Park now open! Woolco in The Galleries was a prestige store – possibly the flagship for the whole mall when it opened in the ’70s.